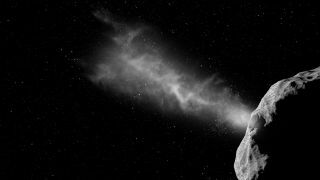 The joint NASA/ESA's Asteroid Impact and Deflection Assessment (AIDA) aims to slam an impactor into an asteroid in 2022 to test deflection technologies. BERLIN — If a large asteroid were headed for a direct hit with Earth, humanity probably couldn't count on Bruce Willis and a nuclear bomb to save the world from certain doom, "Armageddon"-style. But a robotic spacecraft might be able to push a deadly asteroid off its collision course. Though scientists believe that big, Earth-threatening asteroids are relatively rare, the 2013 Chelyabinsk meteor strike offered a stark reminder that there could be potentially dangerous objects in Earth's solar system that have yet to be discovered and studied. The space rock that exploded without any advance warning over the Russian city of Chelyabinsk was only about 65 feet (20 meters) wide, and yet the meteor injured 1,200 people and damaged thousands of buildings. A bigger asteroid could wipe out a whole city, scientists have said. "We know the approximate number of objects in the different size classes, but we know almost nothing about their characteristics," Alan Harris, a senior scientist from the German Aerospace Center (known by its German acronym, DLR) told reporters at a press conference Monday. "To prepare for the deflection of an asteroid, we need to know much more." The letter that Harris and more than 100 other scientists signed noted that, of the thousands of known near-Earth objects, there are currently more than 1,700 asteroids considered potentially hazardous. AIDA is really two missions: ESA's Asteroid Impact Mission (AIM) and NASA's Double Asteroid Redirection Test (DART). Both would fly to the binary asteroid system Didymos, which is set to pass within 6.8 million miles (11 million kilometers) of Earth in 2022. This binary system consists of the 2,625-foot-wide (800 m) asteroid Didymos and its smaller "moonlet," Didymoon, which, at just 560 feet (170 m) in diameter, is about same size as the Great Pyramid of Giza. If the mission goes ahead as planned, the AIM spacecraft (which would be about the size of an office desk) will launch in October 2020 and arrive at Didymos in June 2022 to study the asteroid system and put a lander on Didymoon. AIM will also have a front-row seat to witness DART's impact with Didymoon. When DART crashes, it will slightly adjust the orbit of Didymoon around Didymos, testing the type of technology that could one day be used knock a dangerous asteroid off its trajectory. "We have never visited such a small body," said AIDA/AIM principal investigator Patrick Michel, ofFrance's Observatoire Côte d'Azur and the nation's National Center for Scientific Research (CNRS), who was one of the scientists who drafted the letter. Didymoon's small size will indeed pose some challenges. For instance, scientists have hardly been able to characterize the moonlet from the ground. "We don't even know its shape," Michel told Space.com. And Didymoon's gravity is minuscule. The object has an escape velocity of just 0.13 mph (0.21 km/h), meaning if you could stand on the surface of the asteroid and jump, you wouldn't come back down to the surface of the space rock; you'd just float away, Michel said. Putting a lander on the surface of such a small body and getting it to stay there will be difficult, he added. The mission managers behind AIDA are concerned not only with testing technology that might protect Earth from an asteroid impact, but also in gaining scientific knowledge. Asteroids are leftovers from the early formation of the solar system, so it's hoped that up-close examination of Didymos and Didymoon would also yield a wealth of scientific data and surprises about asteroids, like ESA’s Rosetta mission did for comets. And AIDA would be the first mission to allow scientists to observe an impact experiment at asteroid scale, which could be used to validate collision models. "Even though it's a technical demonstration, we will get a lot of science out of it, because we will go to a totally unknown world," Michel said. Some scientists and investors are looking for ways to exploit asteroids for their natural resources, and the data AIDA collects could inform future asteroid-mining missions, researchers added. The appeal for support comes at a crucial time for AIM. In early December, ESA's Council of Ministers will meet in Lucerne, Switzerland, and decide whether to approve funding for the mission. To take advantage of Didymos' close approach to Earth, AIM would have to launch in October 2020 to reach the asteroid system. Scientists and industry leaders involved in AIM said they were hopeful that the mission would get the go-ahead from ESA's delegates in just a few weeks. "We are really optimistic, because it is a very unique opportunity," said Cornelius Schalinski, deputy head business development for OHB, the German private space company charged with leading industry partners in implementing AIM. "It has to go in 2020. Otherwise, the opportunity is lost," Schalinski told Space.com. "It is an asteroid that gets pretty close to Earth, so we can, with comparatively small cost and effort, test technologies that we need for future missions that are further away." The next several years could be a boon for asteroid research and exploration. In addition to AIM and DART, the Japanese space agency, JAXA, has its Hayabusa 2 spacecraft set to reach the asteroid Ryugu in July 2018 for a sample-return mission. A month after that, NASA's OSIRIS-REx probe, which launched in September 2016, will arrive at its target, 101955 Bennu, on its own sample-return mission. And NASA's Asteroid Redirect Mission, scheduled to launch in late 2021, aims to pluck a boulder off the surface of a near-Earth asteroid and bring that piece into orbit around the moon.